Cornish All Blacks director of rugby Neil Bayliss believes ill-discipline has cost his side in the opening games. 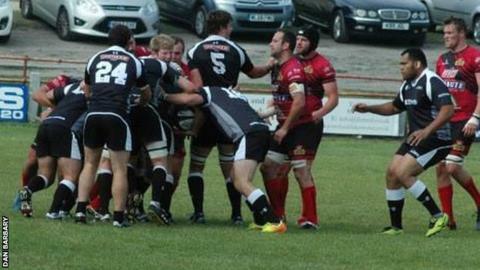 Launceston lost both their National Two South matches against Bishops Stortford and Redruth by one-point margins. "We looked at the penalties we conceded and certain guys have put their hands up," Bayliss told BBC Radio Cornwall. "We gave away about 15 penalties in the game with Redruth, which is not acceptable at any level of rugby and we're targeting a big improvement." The Cornish All Blacks welcome Shelford to Polson Bridge, a team they rueing the missed opportunities that could have seen them win both their opening games. "To lose two games by a point is frustrating but I'm pleased with the way we've been playing," added Bayliss. "Maybe we're not scoring enough from the opportunities we're creating, we're certainly throwing the ball about and playing a good style of rugby. "We just need that first win and the way the boys are training we'll be well prepared for Shelford."